These photos are from our Victorian tour of 'Enchant', an ancient Celtic folk tale adapted to the Australian landscape and told through fire arts and stilt dance. This show has also been performed in Ireland, Hong Kong, and New Zealand. 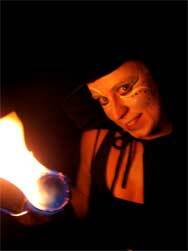 These photos show fire orb work, fire fans, acro balance, poi and flaming snakes. Click on the thumb to view a larger image.